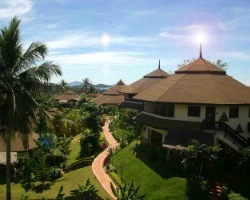 Located on a hillside, with views overlooking four bays, mountains, and surrounding islands, the *Mangosteen Resort and Ayurveda Spa* is a wonderful hideaway. Each villa has a relaxing atmosphere, outside garden bathrooms with rain showers, private whirlpools, and terraces. The on-site amenities include a large pool with sea views, open 24 hours. You can pamper yourself with the many spa treatments offered, and enjoy Eastern and Western cuisine at the on-site restaurant. Or take a free shuttle bus and venture to Nai Harn Beach in the national park, one of Phuket's most popular beaches. To discover more, please visit www.mangosteen-phuket.com. Perfect resort for peaceful and relaxing vacations! RTU until 2021! Buyer may receive a title fee credit, inquire for details! Annual floating week! 10 years of usage! Enjoy relaxing vacation with stunning views! Willing to negotiate! Buyer May Receive A Title Fee Credit!